Shares collapsed after the company released disappointing results in one of its two phase 3 clinical trials. After reporting disappointing news from an important late-stage clinical trial, shares of Novan (NASDAQ:NOVN), a clinical-stage biotech focused on dermatology, plunged by more than 75% in early-morning trading on Friday. Novan reported top-line results from its two phase 3 trials that were testing its lead compound -- called SB204 -- as a hopeful treatment for acne vulgaris. The first trial was called NI-AC302. The data from this study looked quite good, as SB204 was able to meet all three of its co-primary endpoints. However, in the second trial -- called NI-AC301 -- SB204 was only able to meet one of three co-primary endpoints. "While we are pleased with the results of the NI-AC302 trial that met the regulatory requirement for statistically significant efficacy of SB204, we are disappointed with the discordant results of NI-AC301. Our team has not yet received the full data set and we intend to provide an update on the SB204 program after our complete analysis"
Traders are not taking the news well, which is why shares are plummeting today. If you're looking for a positive spin on today's update, the positive data from NI-AC302 does hint that the drug might not be dead yet. Novan's future isn't completely dependent on the success of SB204, either. Novan has a handful of other drugs that are currently in development, including two drugs that are already in phase 2 trials -- SB206, a hopeful treatment for genital warts, and SB208, which is targeting onychomycosis. Of course, the company just received a pile of cash from investors, but there are already liquidity concerns. Novan's cash balance at the end of September was only $55.7 million, which at current spending levels is only estimated to be enough to keep its doors open through the end of 2017. 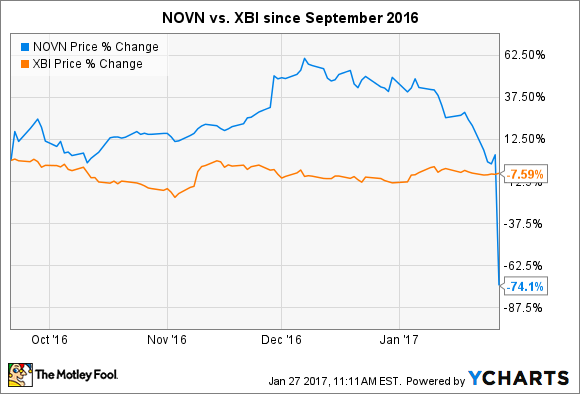 Given today's share-price action, Novan might have a tough time raising additional capital. When you combine today's disappointing news with the company's precarious financial position, this is one stock that I plan on staying far away from for the foreseeable future.